hello and today i am claiming a mesa region. which i asked bla approximately 4350238945 questions about before requesting kol. Personally I'd be fine with you claiming this green area to begin with, if other people approve. I plan to eventually build a road past the mesas through possibly the desert. I could give you permissions to build through dingusland I thought??? Anyway, other admins may possibly want to build in that mesa or that plains biome some time in the distant future, so how about this? You could, but I don't see why you should claim that desert. There are so many other deserts and then we'll need your permission to build anything going through that land bottleneck region connecting us to anything east of it. I think we should keep it opened up to more people atm. If you want less area for your region I'd be fine with that too. <Darvince>bla|craft, people may possibly want to build on the surface or mine on the surface in that region, so instead I will drop the claim for dingusland. I told you my opinion and asked if you were ok with my proposal. If you want to dismantle Darvincia etc. over that, go ahead. 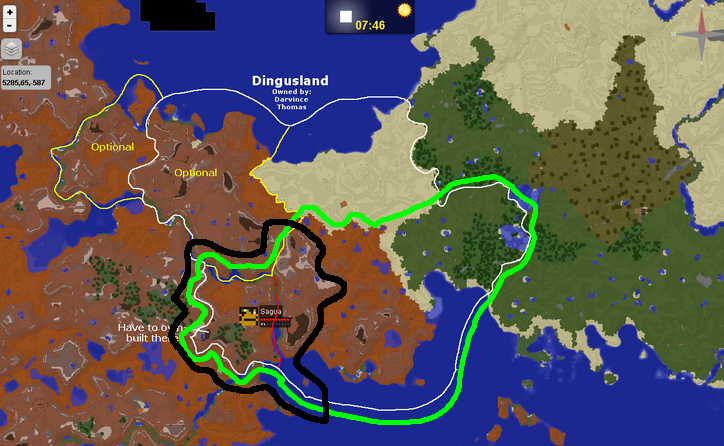 People may possibly want to build on the surface or mine on the surface in that region, so instead I will drop the claim for Dingusland. Additionally, I will also dismantle Darvincia in case someone wants to build in that area that isn't me. okay, but seriously, since I can't have that desert (I respect your decision after looking at the dynmap), I will change the claim, but maintain a similar size. I have replied to your sarcasm in my post above. I don't intend it to be a final decision, but I've mentioned that I have plans for the area and that I think its position makes it worth keeping open to more people. I'd like to hear what other people think and if we should at all begin letting people claim mesa regions yet. All I was saying that I was personally fine with you claiming the area that I marked as green and besides from that I have not decided anything. so I guess this won't happen then? I feel a pain in my viscera, meaning that I am sorry at an emotional level as well as at a superficial level. Please forgive? I'd be fine with that proposal personally, I'd like to hear what others say. I'll probably set up a poll for whether we should allow claims of the mesa biome first. I think the islands in the east of that claim look a bit out of place for that region, they seem to more naturally belong to the land south of it, but I don't care much about them personally and wouldn't have a problem with them being claimed. I don't care about the islands either, but I was trying to keep the amount of mesa claimed the same as before, so I claimed those islands. This time I am being a reasonable human being that is willing to negotiate, so long as a single core region of it remains. This looks fine to me. I'd wait with the eastern part unless there are any specific plans for it. Okay, that's the closest to what I wanted, shall we begin voting? I was a big hesitant to claim areas closer to the savanna village because I found chests with things in them when i was there getting savanna wood for Darvincian tree farms. I think voting can begin.